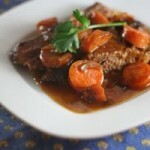 Beef Pot Roast is a crock pot recipe for rump roast served over mashed potatoes. Beef bottom round rump roast, about 2 lb. Put carrot chunks and onion wedges in bottom of greased 3-1/2 quart crock pot. 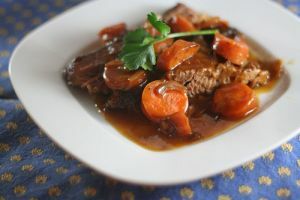 Brown rump roast on all sides in frying pan and put in crock pot on top of the vegetables. Pour beef broth over meat (more liquid will accumulate as the roast cooks); put lid on and cook on Low for 8 hours. About 45 minutes before it’s done, boil the potatoes. Just before you’re ready to mash them, take roast out of crock pot and slice it up. Open canned soup and put it in small batter bowl; add just enough juices from the crock pot to stir it and get the lumps out. After you’ve done so, pour it back into the crock pot and stir to mix. Add the beef slices and stir to cover with gravy. Put the lid back on. Mash the potatoes, then add some margarine and stir till it’s melted. Heat about ¼ cup milk in the microwave, then stir it into the potatoes along with salt, pepper, and about ½ tsp. or so of horseradish. Serve meat/vegetables beside and gravy on top of potatoes, or all of it on the potatoes.